After what has seemed like an eternity, Jody Daily and I are finally able to rip the shroud of mystery off of our latest endeavor: a near-as-humanly-possible-to-exact-scale-replica of the Haunted Mansion's most perplexing spectral resident - the Hatbox Ghost! If you don't already know, the Hatbox Ghost was originally created to inhabit the Attic Scene, along with the forlorn bride. There among the dusty clutter of old trunks and furniture, the top-hatted ghoul would confront the endless procession of Doom-buggies while dangling a hatbox from his bony hand. With every beat of the bride's broken heart, his grinning head would disappear from his shoulders, and fleetingly reappear in the hatbox. This visual gag, as envisioned by the ride's designers, would've been accomplished by tricky lighting. 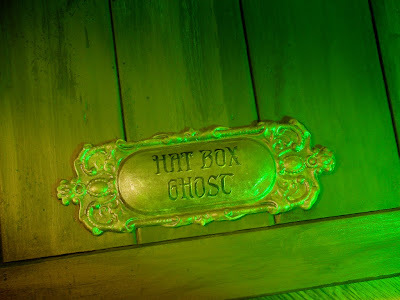 A blacklight pinspot focussed on the ghost's head would turn off and on, while a small light concealed in the upper portion of the hatbox would illuminate his face inside, visible through the box's scrim wall. In theory, it sounds awesome, but the effect didn't work as well as anticipated , and the Hatbox Ghost was removed from the attraction sometime in August of 1969, never to return. Creepy creep with eerie eyes. Fast-forward to today, and the Hatbox Ghost has still yet to show his ugly faces in the attraction. Nevertheless, in the intervening four decades, he has risen to legendary status among his fans, Jody and I included. Earlier this year we were invited to produce some sort of art piece to be auctioned at the upcoming D23 EXPO. Our plates were already overflowing with other projects, but we kicked around several ideas before it suddenly dawned on us what would be the coolest thing in the world to build-- our very own reincarnation of the original 1969 Hatbox Ghost character! With the support of Disneyland and Walt Disney Imagineering, we threw ourselves body and soul into the project. Studying the few existing photos from 1969, and reading everything we could find on the subject (which ain't much), we cleared a large space in our studio and started sculpting. We've produced many detailed replicas over the years, but this one was the most challenging and, I think, the most rewarding. Normally our items are designed and coordinated by us, to be manufactured by Disney's vendors, mostly in China. But this one was different. Even though it's an edition of only one, it turned out to require nearly every skill we've got. Engineering, sculpting, woodworking, metal and plastics construction, painting and sewing. Lots and lots of sewing. His body is plastic and wood armature on a wooden base (it rolls on casters!) designed to resemble attic flooring. His cane is reinforced steel, his hairpiece is sewn nylon fiber, and he's covered from head to toe in sheer chiffon fabric held together by miles of my own hand-stitching. The hands, head and feet are molded resin from my original sculpts (and cast by our friend Doug Hild who, FYI, molds the artist maquettes for Walt Disney Feature Animation.) Even his coat buttons are special, fabric-covered wooden turnings. When all was assembled, Jody gave the entire piece a super-deluxe custom paint job. From the 1969 photos, the original figure's body appears to be quickly made out of bunched-up plastic drapery, similar to the plastic used for shower curtains. Our replica needed to be much more resilient, since it will be loaded onto trucks, set up in the Anaheim convention center, and ultimately packed off to haunt some lucky bidder's collection. 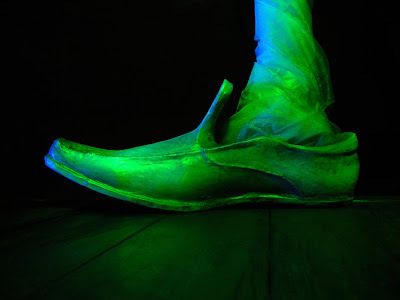 It also needed to be relatively lightweight and safe, so chiffon fabric skin over plastic provided a vaporous ghostly effect, while holding its shape. Over the span of a couple months, our 1969-style Hatbox Ghost took form. Long before he even had his hair or costume, he was already starting to look very... um, interesting! We even had to temporarily tape paper over the windows to prevent the little kids next door from seeing this freaky thing we were making. I admit, it'll be sad to see him go in the auction on Sept 12, but in the meantime, I plan to take a lot of fun pictures of him. Our version of the figure was never intended to be installed in the attraction, but Jody and I have daydreamed of how exciting it would be to see the character brought back to Disneyland someday. Man, it would be amazing! Brass name plate on the Attic floor base. Join us for an ultimate Disney fan experience as we unveil the magic of Disney during our D23 Expo Live Auction. Disney enthusiasts will have the opportunity to bid on unique Walt Disney Studio and Theme Park experiences, tours, one of a kind artwork, props and more. Great work as usual. I look forward to seeing it at D23. Amazing job guys! What on earth could be next...? Thank you for truly making the most of this awesome opportunity. Although *I* won't be bidding on the piece, I'm confident that the world is richer for containing such an item. You guys are amazing. While I'd never be able to bid on it I'm sure, at least I'll get to see it in person at D23. And now that you have the molds... Hey WDI, any ideas?? mortal ends up paying for this, it will be a bargain! Be prepared to accept many kudos from the Expo's cheering shroud...er, crowd! Oh, to be a millionaire! I would LOVE to own this figure. Unfortunately, I am in no financial position to bid. At least, not without taking out a loan on my home. I even missed the sale of the Hatbox Ghost Big Fig. The Hatbox Ghost has been my favorite Mansion character since first seeing him, shortly after the attraction opened. And I don't care what Disney says, he WAS there! 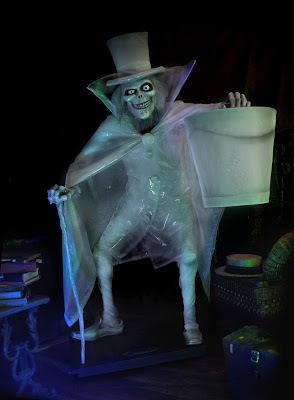 As someone who is very interested in art and is considering dabbling in sculpture of similar nature, I am extremely interested in knowing more about how you made your wonderful Hatbox Ghost. I hope that, in future articles, you will blog about your process with this project in greater detail and include pictures. I was captivated by your accounting of the tiki face restoration. 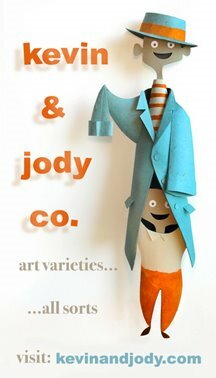 Your works and that of Jody Daily are nothing short of genius. I'm very happy to have found your pages online and take great delight in viewing your pictures, many of which bring back fond, fond memories. Thank you very much for sharing your artist portfolio and interests. If there were more blogs like yours on the web, I'd never get any sleep. I couldn't imagine anyone else doing a better job. You and Jody really know what you're doing! And your passion for the subject is very evident. I was so hoping that this was intended to replace the long-lost original, but maybe the "powers that be" at Disney will take notice and commission a duplicate for the attraction? I don't know how all that sort of stuff works. It would sure would've been a great way to celebrate the 40th! I've said it before and I'll say it again, "Where are my pants!?!?!?" I am not Donald Duck! Wow, amazing! Great work, and this is also my first time visiting your blog. What a cool company. I'll be checking up on what you two are doing very often! BTW, "Hatbox" is one word. Absolutely amazing! If only I had a wealthy benefactor so that I could be sure of being the top bidder! I think the really winning bid is if you two were commissioned to construct the replacement hat box ghost for the attraction itself. That's a truly stunning piece. You foolish mortals get me every time! 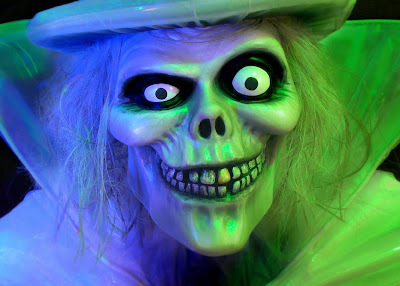 You should have a Hatbox Ghost parade and show him off around town! I envy all the D23 expo-goers who get to see it in person! The wait for the 2nd batch of photos was well worth it! You two are just TOO dang talented. Fantastic job! This is just what my house needs. Come to mama! Thank you for the swell comments EVERYONE! Tom Slick, I wish I was lying to you, but sorry no. 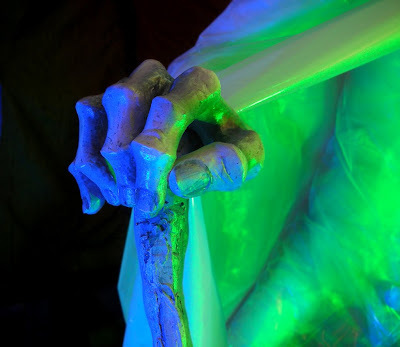 Our figure will not be in the attraction, and was never intended to be, so don't try to find him there on 9-9-09. I'll be there of course, and looking forward to seeing YOU! A ghoul of beauty is a joy forever after. Mr. Kidney, I simply must know! In your studies of me from the photos provided to you of the original Hatbox Ghost figure, as well as in the death-size replica you've made, am I wearing proper pants? It appears to me that I am not; and, frankly, I feel rather slighted — not to mention chilly. Each of The Hitchhiking Ghosts is sufficiently attired, while I am left to brave all eternity in the spirit worlds of the great beyond alfresco. It just doesn't seem fair. And attics can get rather drafty! So, please, dear sir, tell this old spook, are those pants clinging to my bandy legs? Or, am I simply enveloped in a hazy, chiffon aura of mystery? My first memory of the Hatbox Ghost was from an old issue of The E-Ticket magazine, where they disputed the official line there'd never been such a thing. Later on, in one of those "Disney Treasures" DVDs, the legendary Tony Baxter produces a maintenance card from 1969 which he had swiped (!) 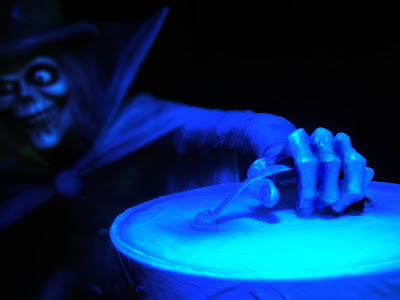 detailing the service done to the Hatbox Ghost. You guys rock! Just a super piece from a pair of super talented artists! Some worsted wool to ease your draft. Your withered limbs in stirrupped breeches. Of styling from the nineteenth century. The tailors tucked their hems in boots. Upon your feet--oh, fashion treason! You wear loafers, for some reason. Perhaps just known to one, Marc Davis. It gives us all gauze to reflect! And friend who's covered my behind. When your britches are ethereal. Thank you for your outstanding reply — and BRAVO! Gadzooks! The poetry's as nice as the original creation! Please, sir, can we 'ave some more? More photographs, sir? Wow. Just...wow. Now I wish I had tickets to the expo, if only to see things like this. I'd love to see them install a hatbox ghost in the mansion itself. Kevin -- I am a casual Disneyana fan and not much of an artist/craftsman. But for some reason, I find that posts like these (meaning pretty much all of your website) never fail to make me smile. So much unadulterated passion and enthusiasm. You manage to stir an amazing nostalgia for things that I am too young to have experienced. Thank you! Awesome as always. Love it. 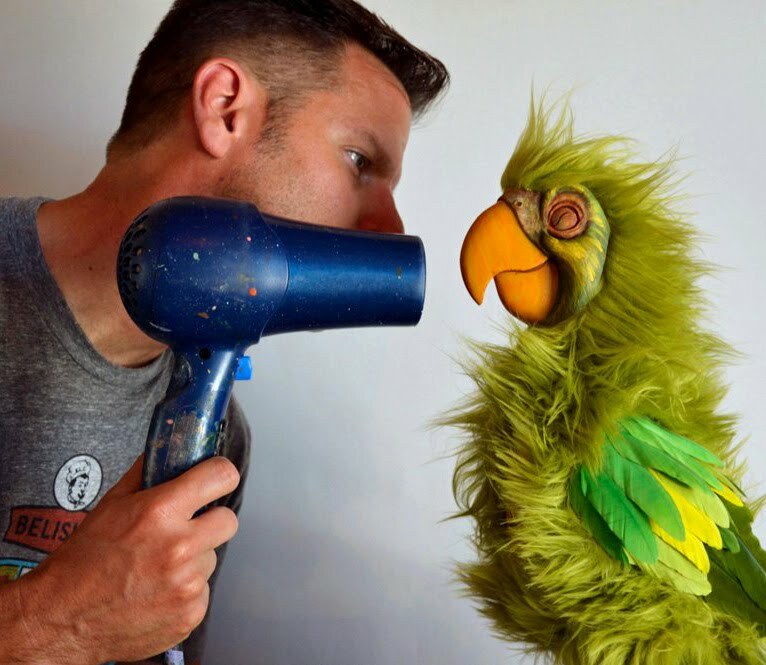 Art director, illustrator, writer, show designer, sculptor, puppeteer, and maker of things. Inconveniently enamored with outdated technology, and pretty much every kind of cultural aspect of the American early 1960s. Will pay big bucks to the guy who produces a plausible time machine. Alice In Wonderland: Vintage Goodies from Wonderland!